In the Andaman Sea off Thailand's west coast, the holiday hub of Phuket, or the 'Pearl of the South' as it has become known, is connected to the mainland by the Sarasin Bridge. Thailand's largest island, Phuket is incredibly diverse with rocky and sandy beaches, tall cliffs, forests, waterfalls, and temples. Phuket caters to all, with a variety of holiday resorts offering accommodation from backpackers and simple guesthouses to modern luxury hotels, though the beachfront bungalows on unspoilt stretches of white sand are rarer now than they used to be. There are numerous activities in or near Phuket to enjoy on holiday, including mountain biking, bungy jumping, and golf. It is even possible to go elephant trekking. A variety of tours offer day trips to the cliffs of nearby Phang Nga Bay, Koh Phi Phi, and the beaches and islands around Krabi. There is plenty to do on the island, whatever your budget, and several offshore islands are good for snorkelling and scuba diving. Phuket has a huge variety of goods and shopping establishments, from markets and street stalls to department stores and specialist shops, and a range of restaurants from Thai seafood to Indian and Western cuisine. Phuket also has its own airport, making it easy to get to and from Bangkok, and although the island hosts thousands of tourists in peak season, its sheer size allows visitors to escape from the madding crowds. Patong Beach is the island's most famous and developed beach resort, offering a wide choice of holiday activities, dining options, and nightlife. 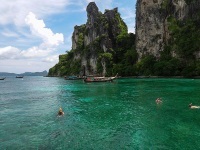 It is situated nine miles (15km) from Phuket City.